If you’re looking for additional comfort and stability, then a manual reclining wheelchair might be the way to go. These chairs serve a variety of purposes for seniors and caregivers. Lying at a reclined position helps take the pressure off hip and back injuries for instance, and it also allows for a more even weight distribution, which can help prevent pressure sores and skin breakdown. Here are our favorite reclining manual wheelchairs on the market today. Why Would You Want A Reclining Wheelchair? This lightweight reclining chair is perfect if the user needs to recline themselves because it uses hydraulics. 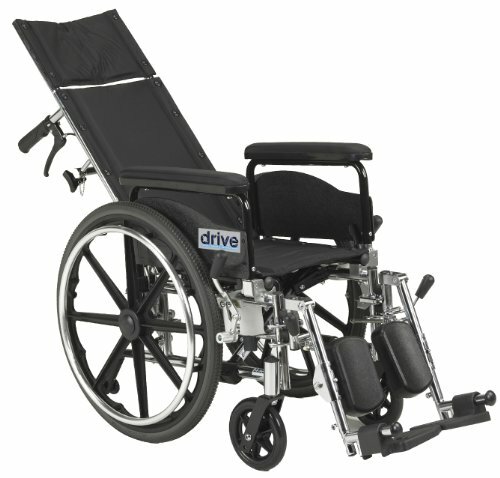 This sporty reclining wheelchair comes from the popular company Drive Medical. It uses hydraulics to lower and raise the back of the chair, making it easier for seniors to use without the help of their caregiver. The back can be adjusted up to 180 degrees, and the arms have an extension to support the user when they are in the fully reclined position. The chair comes with a nice headrest but does not have a lot of padding otherwise. However, we like that the nylon upholstery is durable and lightweight. We also love that this chair arrives fully assembled. It’s ready to use as soon as it’s shipped, which, which is great for older adults who may not be able to put it together themselves. This option accomodates all types of people who desire a reclining wheelchair. This chair is similar to the previous model; the only difference is about two inches of extra chair space. This one has an aluminum frame and weighs 32 pounds when fully assembled. One thing we like about this one is how highly customizable it is. There are seat rail extensions and extendable upholstery to add more backspace if you need it. These features are especially crucial for someone with ALS, Cerebral Palsy, or severe arthritis. The extra back extension can also be added or removed, which is a detail we like to see from manufacturers. Having these types of features is especially crucial for someone with ALS or Cerebral Palsy. The extra back extension does not have to be there all the time, and we like when the manufacturers offer adjustments like this. This chair is affordable and has several unique features that really separate this one from the competition. This wheelchair features thoughtful design elements, like a headrest that prevents the occupant’s head from rolling or tipping to the side. This is a great feature for older adults who have suffered a stroke or who experience muscle weakness. It also has a seatbelt to keep users secure and anti-tippers to prevent the whole chair from tipping backward when it is occupied. In this chair, you can recline from 90 to 160 degrees, and the chair supports up to 250 pounds. It also comes in a wide variety of sizes ranging from 16 to 20 inch seat widths. When you sit down, this chair feels stable and protected. You do not worry about it falling over thanks to the anti-tippers and durable build. This is a solid chair with very little wrong about it. We like that there are many variations, and the chair has a long back rest. This reclining chair from Tracer is a best seller. It is fairly lightweight and incredibly durable. 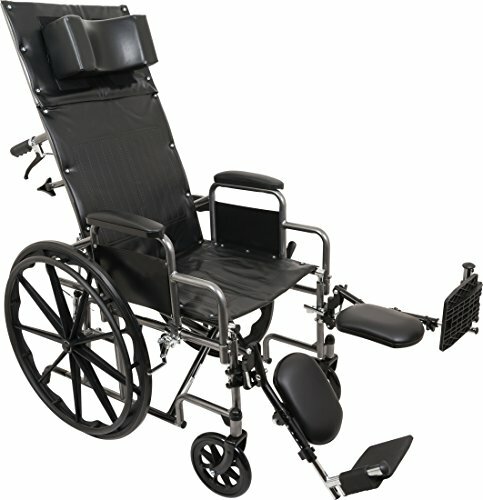 It fully reclines from 100 to 168 degrees and comes with several different special features like removable armrests, swing-away footrests, composite casters, and 24-inch composite urethane wheels. It also comes with a removable pillow to be used at your convenience. This chair is a great option for seniors who plan to spend a lot of time in their chair and want extra comfort and convenience. While this chair does not have as many configurations as some, it still allows you to customize the chair to your needs in several ways. Beyond that, the high back and simple-to-recline factor is what makes this chair one of our favorites for older adults. This chair can be customized from top to bottom which allows each individual to get the exact chair want. This chair features all the bells and whistles if that is what you are looking for. The chair is customizable from top to bottom with varying back heights, seat heights, armrests, leg rests, and tire sizes. By adjusting the rear wheel height, you can help find the right seat-to-floor ratio for your needs. 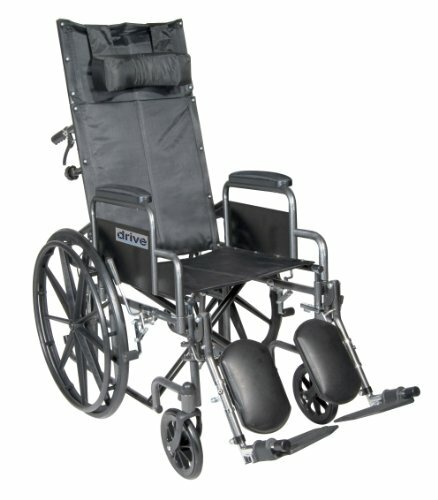 If you are a caregiver who does a lot of transfers, you might want a low seat-to-floor rate, but if the chair is going to be used outdoors on rough terrain primarily, you would want a higher seat. The comfort on this chair is a selling point as well. The vinyl back grips the body nicely, and there is a large detachable headrest on the top. One thing to look out for is whether or not you can use the reclining feature as the operator of the chair. Reclining wheelchairs are a good option for seniors with certain health needs. If the user needs additional support due to a condition like ALS, Cerebral Palsy, or arthritis, this type of chair could be useful. Seniors might also choose a reclining wheelchair because they distribute weight better than a standard chair. Doing this helps to prevent bed sores and additional pain or stiffness for an older adult recovering from an illness or injury, for example. One thing to look out for is whether or not you can use the reclining feature as the operator of the chair. Some chairs only allow the caregiver (or person pushing the wheelchair) to recline the chair. If you are a senior capable of reclining it yourself, definitely get a chair with that feature. If you have decided on a reclining wheelchair, there are a few important factors to consider. Because it’s a long-term investment, you’ll want to make sure the chair meets your unique needs. No chair in the world fits you perfectly off the assembly line, which is why we think adjustability is such an important thing to look for. The best chair is one that can be customized for your preferences – even if those preferences change. Look for a chair that has adjustable armrests, headrests, leg rests, etc. These elements allow you to tailor the chair to your needs and decide for yourself how the chair should feel. If you cannot find something that is adjustable, look to see if the model comes in different sizes. Steer clear of chairs that only come in one standard size. When the chair is fully reclined, it can easily tip backward, so it’s important to protect yourself from this risk. A lot of reclining wheelchairs come with an anti-tipping mechanism attached to the rear tires. This part acts similarly to training wheels by helping prevent falls and adding extra stability. This feature is a must for a senior who lives alone and is going to recline often without the help of a caregiver. Your ideal chair should have plenty of padding on every section of the chair. There should be padding on the headrest, backrest, and leg rests. Having the right amount is essential because it prevents skin breakdowns in older users and helps preserve comfort overall. Depending on the user of the chair, you may want to opt for a “roll-stop” headrest which is a cradle to prevent the user’s head from rolling side to side. It adds comfort and stability to the chair and is a great option for seniors with muscle weakness or coordination issues. This option also depends the individual using the chair. Hydraulic assist lowers the chair with just the press of a button or the pull of a lever. This feature is usually easy for the user to operate by themselves. If the senior using the chair wants to recline by themselves, hydraulic assist is a great way to do that safely. This can help increase the wheelchair owner’s mobility and independence. Hydraulic assist is also helpful for the caregiver since it’s easier and safer than reclining the senior by hand. While armrests can improve comfort, they can also prevent the user from getting underneath tables, so removable armrests are a great feature. Make sure you pay attention to how easy they are to remove. Some chairs have a breakaway system that pulls off and then clips back into place, but some require hardware and tools everytime which is inconvenient for most users.